Shih Tzus – What Do You Know about the Revered “Lion Dog”? Hello lovelies and welcome to our newest breed blog! We hope you’re ready and raring to go about our latest subject, the mysterious, yet lovable, Shih Tzu! We’ve done several breeds already, but this one really tugs at our heart strings! This breed has been around for a very long time and once you take a look at this blog, you’ll know why! 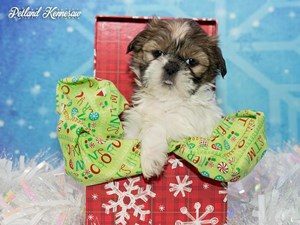 Petland always has Shih Tzu puppies for sale, just check out our available puppies page! The Shih Tzu is formally the Tibetan Shih Tzu Kou. Contrary to popular belief, the Shih Tzu does not originate in China, but in Tibet. The Tibetan monks considered the Shih Tzu holy and kept them in their temples. The Shih Tzu worked alongside the monks, functioning as alarm or guard dogs and even turning prayer wheels in daily Buddhist rituals. They were then sent to Chinese emperors as gifts, thus giving them their Chinese name. In the Chinese language, Shih Tzu means “Lion Dog”, as much for its features as its strength of character. They also earned the moniker of “chrysanthemum-faced dog”, which refers to the way the hair grows outwards from the center of the dog’s face. Shih Tzus have been around the block, a couple times. As one of the oldest breeds in existence, the Shih Tzu’s origins are shrouded in mystery and it’s hard to pin down exactly when they came about. The earliest definitive traces of the breed are Chinese paintings circa 500 AD and also documents describing these dogs being gifted for the second time from China to the Byzantine Empire. Much later, they became the official breed of the illustrious Ming dynasty, who kept them as pets for the royal family for centuries. However, the Shih Tzu very nearly went extinct in China after the Communist Revolution. Sooooo, how did they get here, in America? Because the breed was declining in China, a few citizens of the U.K. wanted to preserve the breed by importing them into the country in the 1930s. This importation essentially saved the breed, as all modern day Shih Tzus can be traced to the original 14 dogs brought from China to England. It was actually American soldiers who brought the Shih Tzu back to America after World War II, where they quickly gained popularity amongst the people. The Shih Tzu breed was then recognized by the AKC in 1969 and currently holds 20th place for most popular breed in America. We think this blog has been extremely informative and we hope you have too! Stay tuned for our next blog coming soon! Interesting in finding out more about the Shih Tzu puppies for sale in our store? Check out our available puppies page to see all of our precious Shih Tzu puppies for sale! The Maltese – Fun Facts about this Aristocratic Breed! Greetings, ladies and gentleman, and welcome to the next segment of our breed blogs! Please kindly don your crowns and jewels as we talk about the most aristocratic and richest breed of dog in all the land, the incomparable Maltese! Now, you may think that the Maltese is just a fluffy lap dog, which is actually mostly true, but they also have a long and fabled past. Read along with our blog to find out more about this curious little breed. 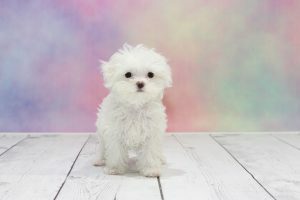 Petland always has Maltese puppies for sale, just check out our available puppies page! The Maltese is how old?? Even though the Maltese is a fairly well-known breed, people are often surprised at how long ago their origins can be traced. As one of the oldest breeds still in existence, The Maltese is said to date back over 2800 years and have graced the laps of Ancient Greeks, Romans and Egyptians. Even their very coats were especially bred and prized by Romans, as the color white was considered sacred. Ancient Egyptians built elaborate tombs for them. And in Greece, they were often painted on ceramics and in murals to depict their popularity. That’s a lot of love! Royalty comes with its perks! The Maltese were the favored dogs of queens and royalty alike, such as Marie Antoinette, Mary Queen of Scots, Queen Elizabeth and Queen Victoria. They were often fed out of golden dishes and wore real diamond collars! That popularity among the rich and famous has continued unto modern times as well. The richest (yes, richest) Maltese in history, named “Trouble”, was bequeathed nearly $12 million by her owner, real estate magnate, Leona Helmsley in 2007! I would definitely call that a perk! You may think that because of their diminutive size, the Maltese is not athletic, but you would be incorrect! The Maltese is an excellent jumper and has little fear of gravity, making it prone to grabbing things high up and getting on couches and beds. They are also described as being loving and gentle, as well as fearless and loyal to their owners. Although, this makes them a little wary of strangers, so introducing new people can be a slow process. Maltese are technically non-shedding or hypoallergenic, which is sometimes confusing to people. They don’t have fur like other dogs, they have hair, which can still fall out, but is more like humans losing hair throughout the day. Because of that hair, they don’t carry dander like other dogs, which is what people tend to be allergic to when it comes to man’s best friend. However, on the flip side, their hair grows continuously and requires daily brushing to prevent mats and monthly haircuts to keep their hair short. Well, we hope this breed blog was as interesting to you as is was to us! Interested in learning more about the Maltese puppies for sale in our store? Check out our available puppies page to see all of our spunky little Maltese puppies for sale! The Labrador Retriever – America’s Favorite Dog Breed! There are probably very few people that haven’t encountered a Labrador Retriever at least once in their lives. Many people have had these lovable companions over the years or had friends and family have them. There are many reasons why the Labrador has been the “top dog” of America’s most popular breeds for 24 consecutive years and we are going into just a few of them below! Petland always has Lab puppies for sale! I know, I know! It sounds crazy, but the Lab originated from Newfoundland as a fishing dog and was originally known as St. John’s dogs, after the capital city. These dogs were bred to be the ideal water dogs. They have a water-resistant double coat that provides insulation, while the short fur doesn’t cause water to drag them down. They even have webbed toes to help when swimming in deep water! And while nowadays, they are more known for hunting, they have an interesting beginning! Showing the love to man’s best friend! The Labrador Retriever was officially recognized by the AKC in 1917 and currently competes in the sporting group. Their colors come in black, chocolate and yellow. They are athletic and highly intelligent, which make them excel at sporting events and hunting trips alike. They are also fiercely loyal and easy to train, thus making them very popular as guide dogs and family companions! As we said above, they have been the number one most popular breed in America for the last 24 consecutive years and show no signs of dropping down! It is said that the Lab makes up about 70% of breeds used as guide dogs, therapy dogs and search and rescue working dogs. This is often because of their sweet nature and strong work ethic. Even as a family dog, their inherent need to please their owners and get along with children and other animals is part of what makes them so popular. They are also great for more active families and do very well outside in all kinds of weather. There are so many reasons to love the Labrador Retriever! Well, this concludes our breed blog on America’s most loved dog! We hope you enjoyed it! Interesting in finding out more about the Lab puppies we have for sale in our store? 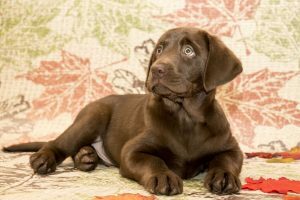 Check out our available puppies page to see all of our wonderful Lab puppies for sale! Hello again all you dog lovers! Time for the next installment of our breed blogs! The pup we’re thinking of this week is a quirky-shaped, fiercely loyal dog with a big personality in a small package. Do you know which breed it is yet? The Dachshund! That’s right, the Dachshund has long been a popular breed in its 300 year history with famous owners such as Andy Warhol, Picasso and Queen Victoria. They were also the first Olympic mascot for the Munich Games in 1972! So read ahead for more interesting facts about this spunky little breed. Petland always has Dachshund puppies for sale! The AKC first recognized the Dachshund breed in 1885 and they were originally only black and tan and one size. However, since then, the Dachshund has become one of the breeds that have the most varieties recognized. The Dachshund comes in 12 standard colors and three different kinds of markings. They also have two accepted sizes, standard and miniature and their coats can be smooth, long or wire-haired. That’s a lot of choices for a new owner! So, what’s with the “hot dog” body? Because of the Dachshund’s unique shape, it makes it one of the most recognized breeds out there. However, they weren’t bred this way for cuteness! Over 300 years ago, they were originally bred to hunt badgers. Their name literally means “badger dog” in German. Their short legs and fierce nature allow them to enter badger dens and take on animals larger than they are in the small spaces. And as far as the body is concerned, it has been said that the modern day hot dog is, in fact, named after this spunky little breed as they were the favored companion of German butchers! Dachshunds are a formidable breed. In addition to being currently 11th most popular breed in America, they have many qualities that make them a great companion. They are rated as the smallest hound dogs and make wonderful rodent hunters. They also serve as exceptional guard dogs, alerting family members to possible intruders (or the occasional mailman). And, finally, they are well known for their athleticism and courage, which made them a perfect mascot for the Olympic Games! We surely hope you enjoyed this breed blog on the Dachshund! 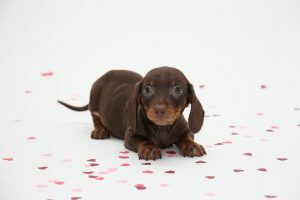 Interested in finding out more about the Dachshund puppies for sale in our store? Check out our available puppies page to see all of our adorable Dachshund puppies for sale! Pomsky Puppies – Why You Need One of These Pups in Your Life! The Pomsky puppy quickly took over the list of hottest breeds of 2016 and it’s looking like 2017 will be no different! And that’s why the Pomsky puppy is going to be the subject of our next breed blog, the first of the New Year! Petland always has Pomsky puppies for sale! What is a Pomsky puppy? So, this precious little breed is actually derived from a cross between a Siberian Husky and a Pomeranian. The cross usually consists of a female Siberian Husky and a male Pomeranian. This is a way to avoid any complications that may occur from a Pomeranian carrying puppies from a larger breed of dog. Pomskies tend to be smaller than Siberian Huskies, but not a toy sized like the Pomeranian. What do Pomsky puppies look like? Well, as with any hybrid or designer breed puppy, you are getting genetics from two separate breeds of dog and the puppy can exhibit a wide range of characteristics. Some Pomsky puppies will have the typical black and white coloring of the Husky, but sometimes they take the all-over color of the Pomeranian. Some will have blue eyes, some green or in rare cases, they might have two different color eyes! Because both the Husky and the Pomeranian have thick coats, you will almost certainly have a fluffy puppy. Neither parents of the Pomsky breed are hypo-allergenic, so if anyone in your family has dander related allergies, the Pomsky might not be the breed for you. What is the temperament of the Pomsky puppy? 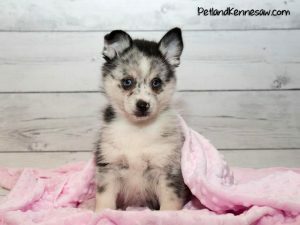 Considering that both of the parents of this breed are active and playful, it only makes sense that the Pomsky will also be an energetic member of the family! Siberian Huskies are also highly intelligent and loving. While the Pomeranian breed tends to be very protective of their owners and make for wonderful guard dogs. A Pomsky puppy is so unique in that they could display any combination of these traits and be a perfect addition to many different types of families! Interested in finding out more about the Pomsky puppies for sale in our store? Check out our available puppies page to see all of our precious Pomsky puppies for sale!